BUT. When I see some letters on a ship, I will like to be able to read them. If the fonts are too small, it is difficult to read from a distance. And that is very annoying. An example is the fonts of yhe ships name in the bow. You have to be very close to the ship, to be able to read this. For ME it is not a problem, because I know Nordstjernen. But I guess it will be interesting for other people to know the name of thew ship, when they see a beautiful lady like this appearing. Good point, maybe I should reserve judgement (and my disco-dancing ) until I see a photo taken from a distance. But I think this is more "cute and fancy" than I feared. 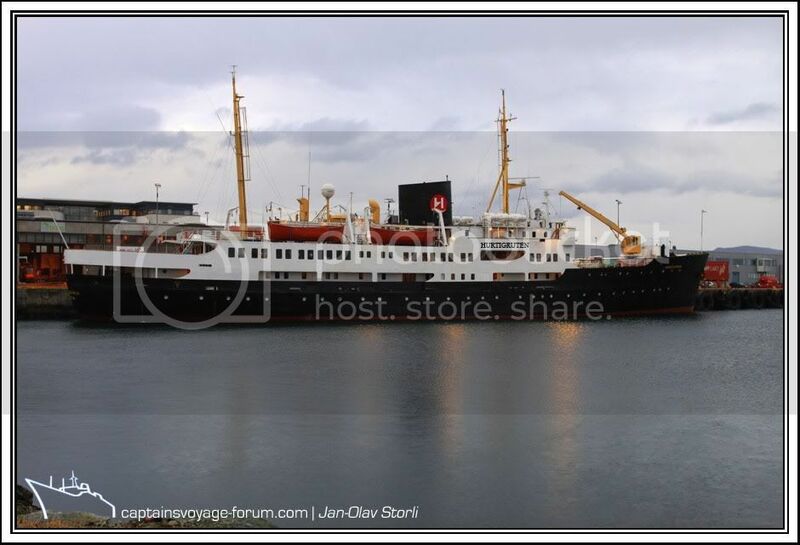 I think hurtigruten made a successfull location for the letters. 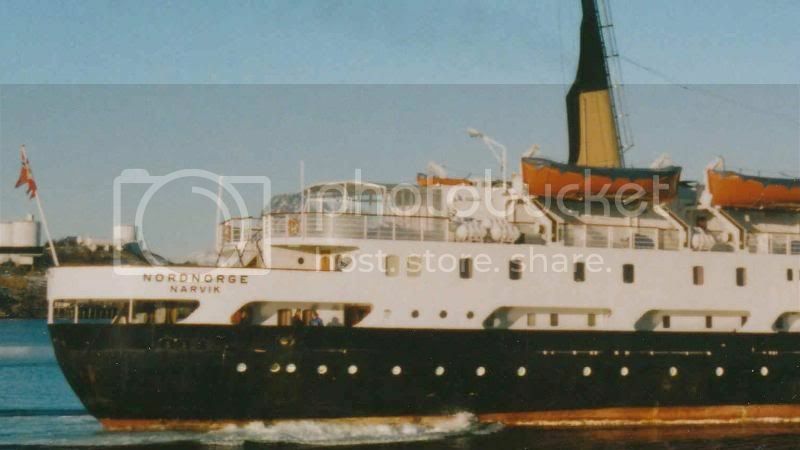 I totally agree that the old Nordnorge looked good with her name on the quarter, i think it really suited her. But, it only looked good because they got the proportion and the font right. 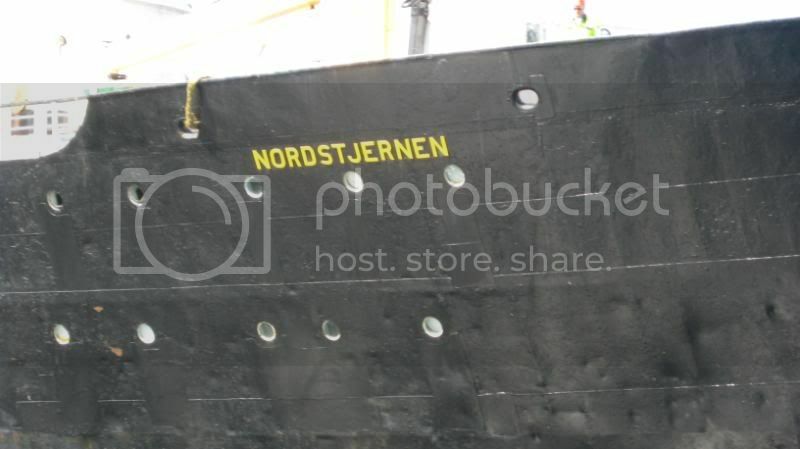 If her name had been plastered across her quarter in the same size font that is now being used for the 'Hurtigruten' sign, it would have looked horrible. Having said that though, it will be interesting to see a full view of her, just to see how she really looks with it. Fits like not all the way into the logo of the "Nordstjernen"
I’d been waiting to see more pictures before saying anything. Well now, seeing pakarang’s photo:- “smaller and a bit to the left” would be a lot better. Or how about "HURTIG" on the port side and "RUTEN" on the starboard side, linked together round the back with a chain of small random animal/flower symbols. It would be only slightly more ridiculous then what the Gnomes of Narvik have chosen. I think I must be a conservative. Last edited by Clipper; November 28th, 2009, 17:08. Forgive me Captain Sir, but i have played with one of your images. Two minutes playing in PS and I moved the offending 'Hurtigruten' name. Still looks silly, but i think it's an improvement on the over sized and badly placed mess they made on her quarters. Last edited by Steve.B; November 28th, 2009, 17:42. But your suggestion is superb. You mean like this? That actually looks quite nice indeed! That`s excatly what I ment. I tried to write it just like that with a pen on a paper print of one of my old pictures of NX. And found it quite good. That's it!!!!!!!!! - I really like the look of that. Now all we need is some influence in Hurtigruten HQ ! Oh yes, that looks much much better. In fact i think it looks very natural for her. Fits in really well. I think Jan-Olav should email that image to them - no need to say anything else in the email, the image say's it all!